A yard master for Amtrak, center, works with dispatchers and console operators at the control center for New York Penn Station. Phil Kaplan has worked for Amtrak for 37 years, and he takes us for an unusual behind the scenes look at the Central Control room. The ERA is pleased to announce a free tour (for ERA members only) of the Penn Station Central Control Center (PSCC). Also known as the Claytor-Scannell Control Center, this is our first visit to the control center in many years and it is sure to be a treat. Penn Station is a major terminal for the Long Island Rail Road, New Jersey Transit and Amtrak. Sitting below Madison Square Garden, the station serves approximately 600,000 commuters daily. 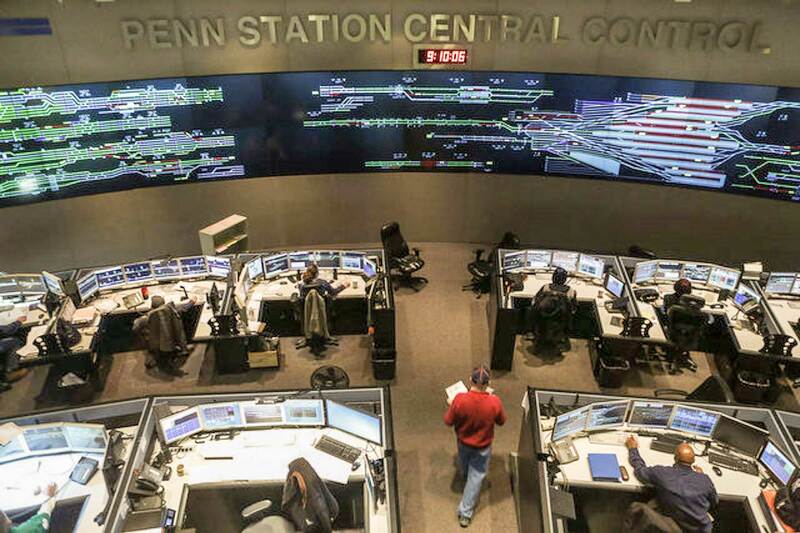 This will be an exclusive tour of the control center behind the busiest train station in the U.S. You will get to see the inner-workings of three major Northeastern Railroads and there may be other surprises in store. We will meet at 11 AM at the Penn Station entrance at West 31st St. and 8th Ave. at the top of the escalators. Tour Price: Free for all paid ERA members! This tour is free, but due to the attendance limit of only 20 people, 2016 ERA members will be given preference. Sold out For further information, please contact Nayan Naidoo erausa.org/contact or call 718-551-8755.